NDAC Wooden Wigwam Facilities and Information. A Hospitality tray is provided for your refreshment should you require a top up of Tea, Coffee, Milk or Sugar Sachets please contact a member of site staff who will be happy to help. Each unit has its own outdoor seated area adjacent to each unit for your comfort we also have fire pits located outside each unit. If during your stay we can be of any further assistance to you please speak to a member of staff who will be more than happy to help. Activities (Wire Zip Slide, Atlantis Aqua Park & Giant 3G Swing) generally only run at weekends, bank holidays, some school holidays and occasional mid week dates. If you are planning to take part in activities during your stay, please check availability prior to booking your accommodation. Check out and return keys by 1030hrs (on day of departure) housekeeping will be cleaning units from this time onwards. The Standard, Deluxe and VIP Wigwams are not suitable for disabled access at this stage. There are strictly no camp-fire facilities available at the Deluxe or VIP Wigwams. Due to their wooden structure and extensive decking, no naked flames are allowed. Each Standard Wigwam has a free stone base fire pit for your own use while you are at site. You are only to use the fire pit areas for a camp fire only (you are not allowed to cook food over the open fires). There are a number of stone BBQ’s situated next to the play area as you come in the entrance. These are available for you to cook your own food and are also free of charge. No disposable BBQ’s are permitted on the site due to Health & Safety and Fire Regulations. For the Standard Wigwams, we have a basic toilet and shower block within the Wigwam village. This is situated near Wigwam 18. Please be aware that the toilets and showers in the Standard Wigwam Village are not currently suitable for disabled access, but plans have been agreed to upgrade the facilities in the future. The changing rooms, further showers and disabled toilets can be found next to the main facilities building at the North-East corner of the car park. With breathtaking views overlooking our Chepstow quarry, the View Café Bar serves an extensive range of hot & cold meals as well as a wide selection of beers, wines and soft drinks from the licensed bar. We also have two very posh coffee machines that make a lovely freshly ground coffee, perfect to prepare you for a day of activities. The View Café Bar is for everyone; Divers and visitors alike are able to sit inside or out on the decked veranda. When you sit at one of our tables with the stunning views across the water you'll see why we've named our Cafe Bar 'The View'! Each Standard Wigwam also has it's own picnic bench available for you to use. The VIP/Deluxe Wigwams come with ready made bed, towels, complementary toiletries and basic cooking and washing-up equipment. The Wigwam contains a double bed and a pullout double sofa bed. The bedding included is for one couple, additional guests booked receive a deluxe bedding pack which includes sleeping bag and pillow. For Standard Wigwams you will be required to bring your own sleeping systems, towels and pillows with you during your stay. 1 x Sleeping Bags £3.00 per person per night, or double sleeping bags for £5.00 per bag, per night. The whole sleeping pack can be hired for £5.00 per person per night. Items may be hired individually. 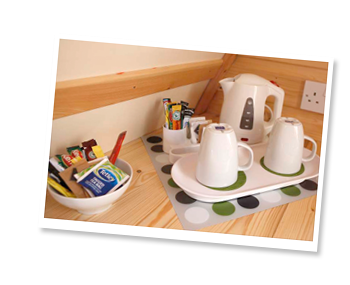 The VIP/Deluxe Wigwams include a microwave, fridge, toaster, twin hob, kettle, pans, frying pan, cutlery, plates, bowls, cups and some cooking utensils. It does not include a sharp knife, bottle opener or tin opener. Please uses the bays provided by your wigwam and display your site pass at all times. Only one car per bay is allocated, all remaining vehicles must be parked in the main car park area and display a valid car pass. Car passes are collected from reception when you arrive. A Fire Action information card is displayed inside each unit . Any person discovering a fire to cause concern should raise the alarm and call the emergency services and if possible to do so safely, attack the fire using the appliance from the wigwam safely. Larger 6kg Powder and Foam extinguishers are situated in the BBQ area next to wigwam No 5. Periodically the site shall conduct a Fire Evacuation Drill, notices of which will be displayed in all the public areas the large car park area is where you should muster if a drill is called. A small 1kg hand held fire extinguisher is situated inside each unit on the left hand side of the door. Do not take any risks and please do not return to your wigwam for any reason until authorised and safe to do so. For your safety and comfort while at site ALL our wigwams have been designated as “Non Smoking”. Each Wigwam is fitted with a smoke alarm (please do not cover over the alarms) in the event of any fire outbreak please vacate the wigwam by the main door and muster yourself in the main car park area. If you are found to be or have been smoking inside any unit then a cleaning charge will be raised against you. Please only smoke in the designated smoking areas which are clearly displayed with green smoking area signs. VIP and Deluxe Wigwams are not suitable for children and are only for adults over the age of 18. This is due to the risks associated with their location on a cliff edge. Standard Wigwams are suitable for the whole family. Wigwam bookings must be made by an adult over 18 who is staying in the Wigwam. Under 18s are welcome in the Standard Wigwams, but must have a responsible adult over 18 as part of their group. There are two barked children’s play areas on the site with sandpit, slide and swings. One by Standard Wigwams 18 & 19 and the other at the entrance to the Standard Wigwam area. There are a few children’s toys on the decking of the View Cafe Bar and a covered area by the Wigwam toilet and shower block. Please be advised children play at their own risk and must be supervised by a parent or guardian at all times. Pets are not allowed in the Deluxe/VIP Wigwams. This is due to the risks associated with their location on a cliff edge. We do allow animals to stay with their owners in Standard Wigwams providing that they are kept under control at all times and on a lead. If the animal is not kept under your full control you will be asked to leave the Wigwam and you will not be entitled to any refund. A £5 fee is charged per day, per dog to cover the additional house keeping and cleaning of the wigwam (payable on booking). Any dog mess must be cleaned by the owner prior to check out. Please ensure your Wigwam is firmly locked when leaving your room. CCTV is in operation throughout the site 24 hours a day and monitored for the purposes of crime prevention and public safety. This scheme is controlled by the National Diving & Activity Centre. For further information please contact us.Periodic checks will be carried out by NDAC staff and cars exiting/entering the site are also monitored. You will be issued with a Wigwam key and a combination code for the main gate upon arrival. During silent hours the main site gate will be locked. If you leave or return to the site during this time please ensure you lock the main gate after you have passed through. Please keep 3m away from the quarry walls at all times. The VIP Wigwamsinclude an exclusive hot tub on your own private decked area. Please read the VIP Hot-Tub terms and conditions of use before booking. The Hot-Tubs are for VIP Guests only, they are not available to other Standard or Deluxe Wigwam guests or visitors to the site. When the centre is closed the water area is strictly out of bounds to you and your group. A high level security gate has been fitted to prevent access to the water area. You are free to explore the site and a popular public footpath can be found adjacent to the main entrance. This will allow you safe access around the whole 55 acre quarry area. Please stick to the authorised routes only. Is available upon request from the Shop and View Cafe Bar. A full list of local surgeries and Hospitals is available on the main NDAC website with a comprehensive list of phone numbers and post codes. A Defibrillator is also available and located by the main gate at the booking in unit. All damages, mess left in the cabins and losses (including keys) have to be paid for in full. The lead name on any booking will be responsible for payments. Please leave the cabin in the clean and tidy condition you found it. Additional cleaning above reasonable useage will be chargeable at £10 per hour. Camper vans and caravans are not allowed in the Wigwam Village area, except under exceptional circumstances. If you wish to stay overnight at the NDAC in your campervan/caravan you can use the NDAC main car park. The cost is £20 per night, paid in advance. This is very important to us and your views and comments are gratefully appreciated (both good and bad) so we can continue to improve the facilities and service. Customer observation forms are available for you to complete. Please hand them into a member of staff upon your departure. Alternatively you can contact us using the online Wigwam contact form.